SPP SPTM, NMIMS 1, Vile Parle, Mumbai, M.H., India. ABSTRACT: Oral controlled release pellet formulations of glipizide were prepared using extrusion spheronization technique. Pellets provide specific advantages in controlling the drug release and increasing the absorption of the active ingredient. The major drawback for these systems is dose dumping which is very prominent in presence of alcohol. In the present study, attempt was made to prepare alcohol resistant pellet formulations of glipizide. Glipizide is an oral anti-diabeticdrug belonging to the sulfonylurea group, used for the treatment of non-insulin dependent diabetes mellitus (NIDDM). Various polymers like Eudragit RSPO, RLPO and cellulose acetate butyrate were used for preparing the pellets. The prepared pellets were studied for different flow properties and drug release studies. The in vitro drug release studies were carried out in phosphate buffer as well as in phosphate buffer containing 5% alcohol. Drug release from the pellets was by non fickian diffusion mechanism and was comparable with that of marketed preparations. The pellets also had shown resistance to alcohol dose dumping. INTRODUCTION: Development of controlled release drug delivery systems provide a uniform concentration or amount of drug at absorption site, maintained plasma concentration within a therapeutic range, minimizes the side effects and reduces the frequency of drug administration. A considerable attention has been focused on the development of novel drug delivery systems because of their obvious advantages such as ease of administration, controlled release of drug at predetermined rate, effectiveness in the treatment of chronic conditions and better patient convenience due to simplified dosing schedule. A number of design options are available for the preparation of controlled release formulations to modify oral absorption by matrix pellet. Pelletization 1, 2 is a term used to define agglomeration of drug substances in either powder or granule form resulting in the form of semi spherical and spherical agglomerates having good flow properties. Generally, the particle sizes of the resulting pellets are between 0.5 and 1.5mm depending on the preparation technique. Pellets provide a reduction in the dosage regimen and gastrointestinal irritation, moreover controlling the drug release and increasing the absorption of the active ingredient. One of the advantageous properties of the pellet formulations is being good candidate for the delivery of the drug substances due to minimizing the dose dumping effect 8-11. The reproducibility of the release characteristics from pellet formulations is also much better when compared to the single-unit dosage forms. They are suitable systems for film coating because of the low surface area-volume ratio, resistance to external factors such as moisture, air and light. Extrusion-spheronization is the most commonly used method for pellet production. Use of suitable excipients and fillers can be made to produce pellets of desirable quality. Different excipients from a variety of sources have been evaluated for the formation of spherical pellets. In spheronizer, a plate (diameter 10-1000 cm) rotates within the confines of a cylinder. The extruded, cylindrically shaped particles are broken into uniform lengths almost instantaneously and are gradually transformed into spherical shapes. Glipizide 3 is an oral rapid and short-acting anti-diabetic drug belonging to the sulfonylurea group, is one of the major drugs used for the treatment of non-insulin dependent diabetes mellitus (NIDDM). It is a white odorless powder which is water insoluble. On the other hand it is sparingly soluble in acetone and soluble in methylene chloride and chloroform. It is bound to the plasma proteins with a ratio of 98% having a pKa value of 5.9. Glipizide was administered once or twice daily in doses of 5 to 20mg. The objectives of the present study was to formulate, characterize, in vitro drug release from blend of MCC/Lactose 4-7 pellets loaded with glipizide and to achieve the controlled and alcohol resistant drug release system. Materials: The active substance glipizide is obtained as gift sample from Aurobindo Pharma, Hyderabad. The polymers used in the coating Eudragit RLPO and EudragitRSPO were obtained as gift sample from Evonik industries, Mumbai.Cellulose acetate butyrate was purchased from Signet chemicals, Mumbai. All other chemicals used in the study were of pharmacopeial standards. The pellets were prepared by using extrusion/ spheronization pelletization technique (table 1). Required amount of Glipizide, lactose, MCC and binder were passed throughsieve No.40 prior to pelletization and mixed uniformly in a planetary mixer. Water is added drop wise to bind the mixture to obtain doughmass, which was extruded using a piston extruder (1mm orifice, Umang, India). The extrudates were immediately spheronized for 4 min at a rotational speed of 1400 rpm and an air velocity of 1 kg/cm2. The pellets were dried at 40oC for 2 h in a tray dryer (Labultima, India). Measurement of Micromeritic properties, Granule density and Friability of Pellets: The flow properties were investigated by measuring the angle of repose, Carr’s index (I%), Hausner ratio, Friability (%) of drug loaded pellets. Determination of Drug Entrapment Efficiency: Pellets equivalent to 5mg of Glipizide were dissolved in 10 ml of methanol & sonicated for 5 min. Then volume was made up to 100 ml with buffer of pH 7.5 and filtered. From this filtered stock solution, 2 ml was diluted to 10 ml with buffer (10 ppm). Then absorbance was measured at 223nm to calculate drug entrapment efficiency. 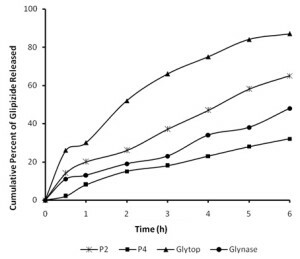 In vitro Drug Release Studies: The release of glipizide from prepared pellets was studied in phosphate buffer of pH 7.5 (900 ml) using an 8 station dissolution rate test apparatus (Campbell electronics) with a paddle stirrer at 50 rpm and at temperature 37±0.5°C. At regular intervals, the sample (10 ml) was withdrawn and replaced with same volume of fresh medium. The samples withdrawn were filtered through a 0.45 μm membrane filter and were assayedat 223 nm for estimating glipizide concentration using UV spectrophotometer. Finally, corresponding drug content in the samples was calculated from the calibration curve to determine the drug release pattern. RESULTS AND DISCUSSION: Extrusion spheronization technique was employed for the preparation of glipizide pellets. 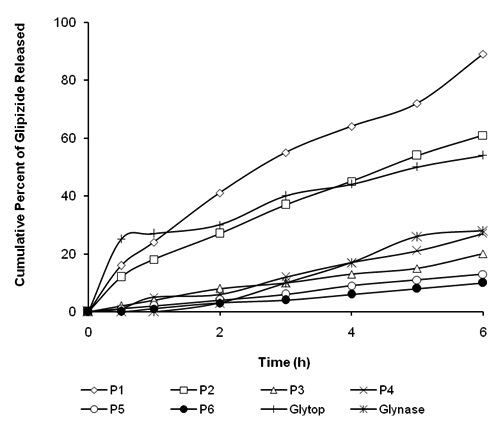 The pellets prepared by using F1 were coated with insoluble polymers like Eudragit RLPO and RSPO in 9:1 ratio to different weight gains viz., 2, 5, 10 % w/w and with cellulose acetate butyrate at 1, 2, 5 % w/w. The prepared pellets were evaluated for different flow properties like tapped density, granule density, angle of repose, Carr’s index and Hasner’s ratio. The flow properties have shown that the pellets were free flowing. Glipizide release from the coated pellets was studied in phosphate buffer of pH 7.5 using paddle at 50 rpm. The glipizide release from the pellets was slow and sustained for more than 6 hrs and depended on the coating thickness. As the thickness of the coat was increased release rate was decreased. A linear relationship was observed between coating thickness and release rate (Ko). Analysis of the release data as per zero order and first order kinetic models indicated that the drug release from the formulations followed zero order kinetics. 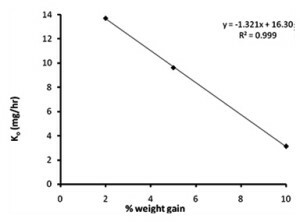 When the release data was analysed as per Peppas equation, the release exponent ‘n’ was between 0.5 and 1 with the pellets indicating non fickian diffusion as the release mechanism. ‘n’ value in case of P6 was more than 1, indicating super case model. Plots of percent released versus square root of time were found to be linear (r > 0.9350) indicating that the drug release from the pellets was diffusion controlled. The in vitro dissolution profiles of the prepared pellets were compared with two marketed preparations. 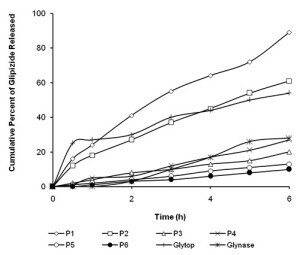 The studies shown that the drug release profile from formulations P2 was comparable with Glytop and P4 was comparable with Glynase. The two formulations namely P2 and P4 were further studied for drug release characteristics in dissolution medium containing 5% alcohol. When compared to marketed preparations the drug release from the prepared pellets was slow and sustained without dose dumping in presence of alcohol. CONCLUSION: Sustained release pellets of glipizide could be prepared by extrusion spheronization technique which is industrially feasible method. Glipizide release from the coated pellets was slow and extended over longer periods of time and depended on the coating thickness. Drug release from the pellets was by non fickian diffusion mechanism and was comparable with that of marketed preparations. The pellets also had shown resistance to alcohol dose dumping. Masazumi K, Hiroaki N. Development of controlled release matrix pellets by annealing with micronized water-insoluble or enteric polymers, J. Contr. Rel., 2002; 82: 335-343. Ponghanaghakul T, Puttipipatkhachorn S. Alginate-magnesium aluminum silicate film: Effect of plasticizer film properties, drug permeation and drug release from coated tablets. Int. J. Pharm., 2007; 333: 34-44. 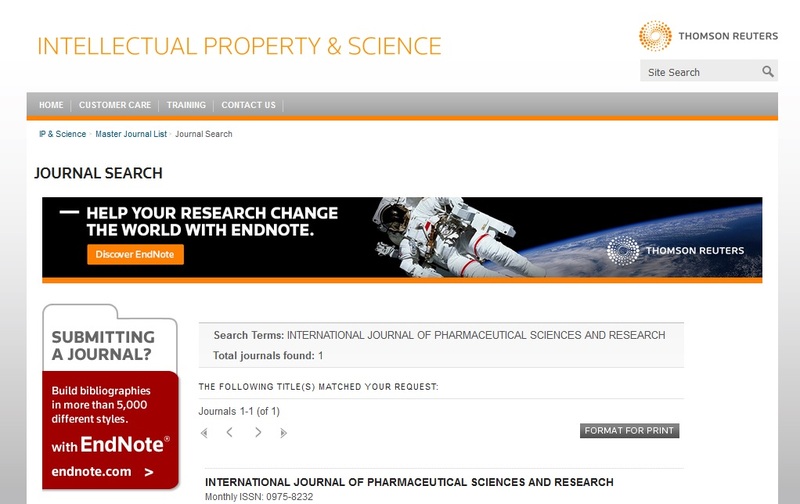 Mustafa SinanKaynak, H. SüheylaKaş, LeventÖner, Formulation of Controlled Release Glipizide Pellets Using Pan Coating Method Hacettepe University Journal of the Faculty of Pharmacy 27; 2:2007, 93-106. Kibbe AH. Hands on book of Pharmaceutical Excipients. 3rd ed. London: Association of Pharmaceutical society of Great Britain. 2000. Kleinebudde P. The crystallite-gel-model for microcrystalline cellulose in wet granulation, extrusion and spheronization. Pharm. Res., 1997; 14: 804-809. Gowda DV, Rajesh N, Afrasim M, Shivakumar HG, Siddaramaiah H. Controlled release behaviour of nifedipine from the pellets of gellucire/ microcrystalline cellulose blends. Int. J. Pharm Tech. Res., 2010; 2: 1215-1226. Rajesh KS, Khanrah A, Biswanath S. Release of ketoprofen from alginate microparticles containing film forming polymers. J. Sci. Ind. Res., 2003; 27: 965-989. 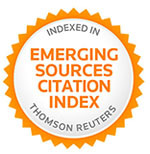 Mannion, Richard, O., Euro-Celtique S.A., Opioid controlled release formulations resistant to alcohol extraction of the opiod. European patent2319499A1. 2011 May 11. Welgang Roth, Abbott laboratories, Abuse resistant melt extruded formulation having reduced alcohol interaction, US patent20100172989, 2010 Jul 8. Florence Guimberteau, Flamel technologies, Multi microparticulate pharmaceutical forms for oral administration, US Patent 20110104266, 2011 Jan 11. Catherine Herry, Ethypharm, Alcohol resistant oral pharmaceutical form based on microgranules, US Patent 20110177138, 2011 Apr 1.